Situational awareness: Nvidia will acquire the chipmaker Mellanox for approximately $6.9 billion. It’s Nvidia's biggest acquisition to date and reportedly tops a bid from rival Intel. And, I'll be moderating a Q&A tonight after the Silicon Valley premiere of the HBO documentary "The Inventor" about the rise and fall of Theranos. We'll have more in Login tomorrow and hopefully a recording soon. For all the many controversies around Facebook's mishandling of personal data, Google actually knows way more about most of us. That's the takeaway from "What Google knows about you," the second in a series of looks by Axios at all the data being collected by large tech companies. Back in January we took a look at "What Facebook knows about you." The bottom line: Just how much Google knows depends to some degree on your privacy settings — and to a larger degree on which devices, products and services you use. In my story, I outline what information Google does and doesn't collect, as well as steps users can take to limit what gets shared with the company as well as ways to see and delete some of what it already knows. Yes, but: Google's reach is nearly inescapable, as Gizmodo's Kashmir Hill found out when she tried to shut the search giant out of her digital life. She not only switched browsers, search engines and email platforms, but also had access to Google-run servers disabled. The result was a nearly unworkable internet and the loss of key services including Spotify, Uber and Lyft. The big picture: Google isn't just its namesake search service. It also gets lots of data from its Chrome browser, as well as from YouTube, devices running its Android operating system, Google Assistant and Google Maps. There's also hardware products like Nest and Google Home. Even those who don’t actively choose Google’s services still probably have a fair amount of information landing on its servers. It's a huge player in digital advertising, with widely used tools for serving ads and providing analytics. Between the lines: A study last year by Vanderbilt University’s Douglas Schmidt found that Google and Chrome are sending plenty of data to Google even without any user action, including location data (assuming a user hasn't chosen not to share such information). Google challenged some of the study's points and highlighted some new privacy tools, but Schmidt says his key findings remain the same. Go deeper: Read the full piece here. The grand bargain of the digital age, in which consumers have traded their data for free services, is coming under belated, but intense scrutiny. However, as Axios' tech team reports, it's too late to regain control of the personal data that's been bought, sold and leaked all over the web for the past 3 decades. In this weekend's Axios Deep Dive, we looked at the many issues surrounding privacy, from proposed regulations to the role of data brokers to the need for massive personal data to provide the raw fuel of artificial intelligence. Autonomous vehicles collect images of everyone they pass on the street. Dozens of companies mine and sell location data from smartphone apps. App developers give personal details to major online platforms. Smart-home devices and digital assistants track your daily habits and have microphones. Genetic testing services share data with app developers and drug companies. Half of the country was impacted by the Equifax financial data breach. Why it matters: If information is power, our lackadaisical approach to safeguarding details about our lives has made a handful of companies more powerful than we ever expected, and it's made consumers more vulnerable than ever. A majority of Americans (64%) say they have personally experienced a major data breach, according to Pew Research Center. Americans listed privacy of data as the top priority companies should address, beating issues like poverty and gun violence, according to the Axios-Harris Poll 100. The big picture: A reckoning is underway. Major tech companies have announced sweeping changes to their businesses, with privacy — or at least their own versions of privacy— in mind. Go deeper: Read the whole report. For years, critics and investors came to SXSW mostly to scout hot trends, products and talents before they got big. Politicians were present, but definitely not front and center. What's new: This year all eyes were on up-and-coming political stars like Alexandria Ocasio-Cortez and Beto O’Rourke, as well as presidential hopefuls like Amy Klobuchar, Howard Schultz, Elizabeth Warren and John Hickenlooper. At one party Axios attended, Ocasio-Cortez received far more attention than the Hollywood celebrities in the room. CNN aired a live presidential town hall Sunday night from Austin in the middle of the festival, which brought well-known political journalists to the event. The European Union stepped up its presence at the event this year, flying its competition secretary Margrethe Vestager in for an interview with Kara Swisher. Attendees at a Vox Media party were shouting "break them up!" during a panel discussion about anti-trust policy in tech. This followed a call from Warren to do just that. Why it matters: The invasion of politicians, regulators and political reporters at the festival shows just how much politics has become entrenched in every aspect of our cultural lives. Yes, but: Noticeably absent from the conversations, events, and parties were conservative politicians and media outlets. Go deeper: Axios' Sara Fischer has more here. 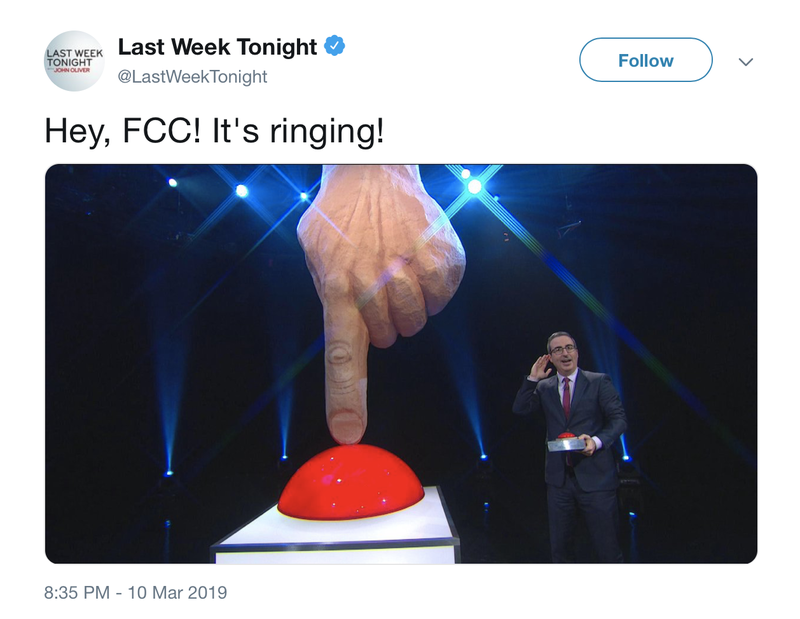 John Oliver from "Last Week Tonight" used a good chunk of last night's episode to highlight the scourge of robocalls, which he noted are the source of 60% of all complaints to the FCC. And, to drive the point home, he is robocalling all 5 FCC commissioners every 90 minutes with a message reminding them that they are the ones who could actually do something about robocalls. Between the lines: Oliver notes that FCC chairman Ajit Pai has done a lot to criticize the practice and has "urged" telecom providers to do more, but he adds new rules are what's needed. Sam Altman said Friday he is stepping down as president of Y Combinator. Check out this beyond-half-court shot from Stanford's DiJonai Carrington. The Cardinal went on to upset top-ranked Oregon and claim the Pac-12 tournament championship.